Tabitha Moses practices at the intersection of art, health and wellbeing; drawing on the experiences of herself and others. She has used the language of fabric and stitch to examine the ways in which we navigate illness, trauma, infertility and healing. 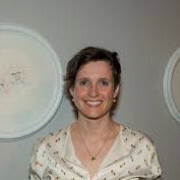 Tabitha has exhibited and undertaken residencies nationally and internationally. She won the Liverpool Art Prize with work based on infertility and IVF. Her piece, Investment: Tabitha's Gown, an embroidered hospital gown illustrating her fertility story, will be part of a permanent exhibition at London's Science Museum, opening Autumn 2019. She lives in Liverpool and can sometimes be found swing dancing or singing in a choir.